3 smaller boneless skinless chicken breasts, cut into small pieces. Heat olive oil in a large skillet. Add chicken breast and cook until no longer pink. Add onion and garlic to the skillet and stir. Season with salt and pepper, chili powder and cumin. Cook until onion is translucent. Add tomatoes, beans and jalapeno and mix well. Cook for another 2 to 3 minutes then set aside. To assemble add 1/3 to 1/2 cup of the chicken mixture to the center of each tortilla. Sprinkle with a little cheddar cheese. Roll up each tortilla and secure with a couple toothpicks. 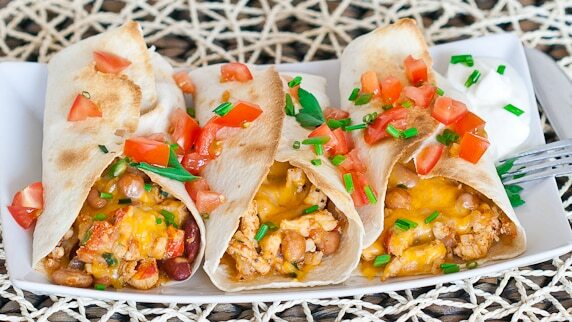 Place burritos under the broiler for about 2 to 3 minutes until cheese has melted and tortillas are slightly golden.